I am in love. Perhaps it's the pregnancy hormones or perhaps it's just that delicious. My new favorite Christmas treat is SO delicious. Literally. That's what it's called. 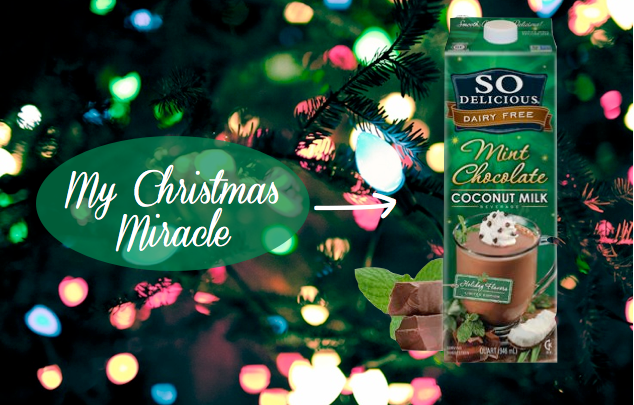 SO Delicious Mint Chocolate Coconut Milk is seriously amazing grace. I was developing an unhealthy habit of peppermint mochas when this heavenly creation saved me from gaining 500+ pounds this year. I bought mine from Whole Foods last week and adding just a dash to my morning (half caf for the baby) coffee has rocked my Christmas world. Best part is that my caloric intake has gone from 410 (omg!) to a whopping 25 calories -- without sacrificing that chocolatey mint taste. I suggest you run, sprint actually, to your local store to pick up So Delicious Mint Chocolate Coconut Milk. Your tastebuds and your body will thank you.